Congress party on Wednesday stated that PM Narendra Modi should act as the prime minister of the country and not be only be partial to his home state Gujarat. PM Modi expressed anguish over loss of lives in various parts of Gujarat due to unseasonal rain. Now that Prime Minister Narendra Modi's apparent and unconditional love and admiration for his 'janmabhoomi' Gujarat is out in the open, the Congress party have clearly stated that PM Modi should act as the prime minister of the country and not be only be partial to his home state, Gujarat. Earlier today, PM Modi expressed anguish over the loss of lives in various parts of Gujarat due to unseasonal rain. Expressing his concern, Modi tweeted, "Anguished by the loss of lives due to unseasonal rains and storms in various parts of Gujarat. My thoughts are with the bereaved families." We completely understand that PM Modi has an old relationship of love and respect with the town and people of Gujarat but when it comes to growth and development of the nation, PM Modi should be impartial depending on the position he holds. On Wednesday, rain and dust storm were reported from Rajasthan, Gujarat, and Madhya Pradesh. But, Modi tweeted saying that an ex-gratia of Rs 2 lakh from the Prime Minister's National Relief Fund will be given for the next of kin of those who have lost their lives in various parts of Gujarat. Modi's Gujarat-specific tweet has met with criticism by Madhya Pradesh Chief Minister Kamal Nath who accused the Prime Minister of not extending similar help for victims of weather-related calamities in Madhya Pradesh. Taking to Twitter, the Madhya Pradesh CM said, "Modi ji, you are the PM of country, not only Gujarat's. More than ten people have died because of lightning strikes amid unseasonal rain and storm in MP. But are your sentiments limited to Gujarat only? Even if you do not have a government of your party but people are here too." Senior Congress leader Digvijaya Singh also slammed the PM Modi and accused him of being partial to Gujarat. 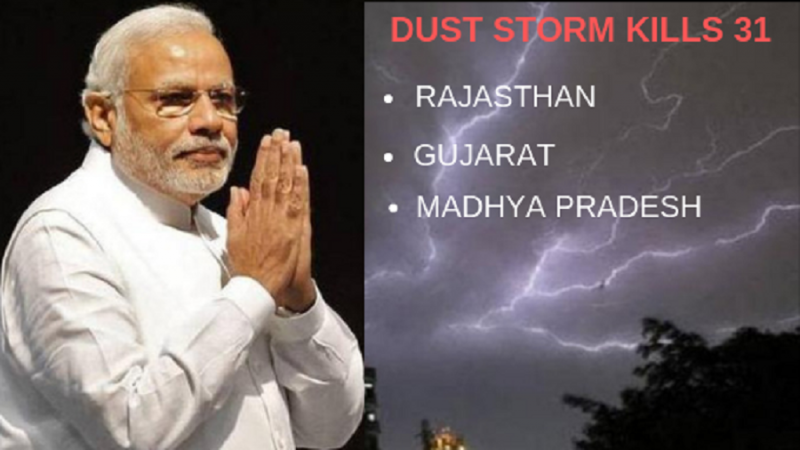 Around 31 people have died due to unseasonal rain accompanied by a dust storm that played havoc in Gujarat, Madhya Pradesh, Rajasthan and Himachal Pradesh. In Gujarat, at least nine people died in accidents following thunderstorm and dust storm on Tuesday (April 16). Nine people were killed in Rajasthan and 20 have been injured. Udaipur and Jhalawar were among the most affected regions. Four deaths were reported from Jhalawar, while in Udaipur, 800 electric poles and 70 transformers have been damaged. A storm alert has been issued by the IMD for Himachal Pradesh as the storm is expected to attain a speed of 50 km per hour.